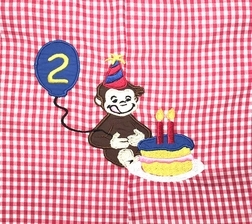 A customer asked us to design a birthday John John/longall for her son's Curious George theme birthday party and this is what we came up with. We just love it! We designed the applique and had it digitized for us. We start with red gingham and make your choice of a John John or longall. The shoulders button with 2 royal blue buttons. 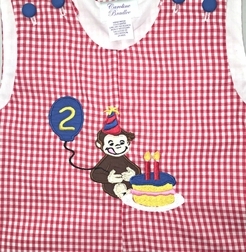 George is appliqued in brown with his cake frosting and balloon in royal blue. His hat is red and royal blue alternating with yellow tassels to match the cake. We put the number birthday your little one is celebrating in the balloon. You may also choose to have a name under George. The cake will hold from 1 to 3 candles. **FOR BIRTHDAYS 4-8, THE CAKE WILL HAVE 1 CANDLE ONLY, BUT THE ACTUAL BIRTHDAY NUMBER WILL BE MONOGRAMMED IN THE BALLOON.